Nearest: Tube Station: Russell Square 140 yards (128 metres), Railway Station: London St Pancras Domestic 0.6 miles (1 km), DLR Station: Tower Gateway 2.3 miles (3.7 km), Motorway: M1 Junction 1 5.7 miles (9.2 km). Within a 0.5 miles (0.8 km) circle of the hotel are 5 tube stations (underground system). Built in 1962 the President Hotel London is situated on Russell Square by the junction with Southampton Row. This is a central location slightly North East of centre. This makes it located to the city side of London affording good access to the City of London, also known as the square mile. Within walking distance of Holborn and Covent Garden with shops, restaurants and other amenities in the surrounding area. Russell Square is a busy commuter route for London through traffic and this means a black taxi will always be easy to find, with good bus and tube links too. One of the busiest shopping areas with the most dense area in Europe for shops is Oxford Street which is less than 0.5 miles from here. Nearest attractions include British Museum (0.2 miles), Dickens House (0.3 miles), Petrie Egyptian Archaeology Museum (0.4 miles), British Library (0.5 miles), Covent Garden (0.7 miles), Theatre Museum (0.7 miles), Leicester Square (0.8 miles), Trocadero centre (0.9 miles), and the National Gallery (0.9 miles). Room amenities include en suite, satellite TV, radio, direct dial telephone, trouser press, modem connection, and tea/coffee making facilities. The following facilities are available on request: fridge, iron, trouser press, computer point, hairdryer and WiFi access point. Onsite the hotel features the Sportsman's Bar and the Saracen Carvery Restaurant. Enjoy the Atrium Lounge where tea, snacks and A la Carte lunch is served from the Atrium coffee bar. The front reception desk is staffed 24 hours. Hotel guests can use the leisure facilities of the sister Royal National Hotel, there are charges for these facilities. Below the Royal National is the Living Well health club with three gyms, a fifteen meter indoor swimming pool, steam room, sauna and many more amenities including beauty treatments. Hotel gusts are entitled to reduced rates. Imperial Hotel London: is 49 yards (44 metres) away, has a guest satisfaction score of 70% and rates start from about £69. Morton Hotel: is 172 yards (157 metres) from here, earns a customer rating of 90% and base rates begin at about £195. Bedford Hotel: 190 yards (173 metres), rated at 80% and with rates from around £68. Royal National Hotel: 271 yards (247 metres), rated at 60% and with rates from around £60. Compared to other London hotels: This hotel has been rated 70% by past guests. The London average is 80% and the average for 3 star hotels is 76%. Therefore this hotel is below average for its sector (star rating) . Imperial Hotels across the chain average 71% so this hotel is slightly below the guest rating for most Imperial hotels. Milesfaster ranking: 729th from 866 London hotels, 3rd of 7 Imperial Hotels, and 245th of 329 three star rated hotels. Would you prefer to go with something that has scored higher in guest satisfaction ratings? If that is what your after then the 4 Star Amba Charing Cross seems like a possible option being 2.0 miles (3.3 km) from the President Hotel. The Amba Charing Cross has an extremely high guest rating of 98%, one of the best rated London hotels. The 50 nearest hotels around this area (60 Guildford Street, WC1 postcode) which we have have on our website extend out to a 0.5 miles (0.9 km) radius. The numbers by star rating are 3 five star hotels (average rating 90%), 21 four star hotels (average rating 83%), 17 three star hotels (average rating 78%), 7 two star hotels (average rating 71%) and 2 one star hotels (average rating 62%). 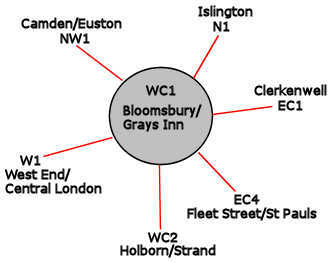 Top 3 star hotels are Premier Inn Holborn and the Arosfa Hotel Bloomsbury (both 90%). Coming out as the top rated hotels is Montague On The Gardens Hotel (4 star) at 99%. Base Rates: We compare area starting room rates by using base rates. Bear in mind we use the published base rates which do not reflect short term offers and deals. They do however give a decent relative comparison. Looking at all hotels in the area the average base rate is £106 per night. They range from a low of £16 at Generator Hotel (2 Star, 77%) up to £363 at Rosewood London Hotel (5 Star, 98%). Rates break down to the following for each star rating: Five Star average: £220, Four Star average: £131, Three Star average: £81, Two Star average: £56 and One Star average: £53. We rank hotels based on their guest rating but balanced for their influencing factors. We rank President Hotel 43rd (joint) of 50 and 14th (joint) for the 17 three star hotels in the area. For lowest base rates in the area this hotel ranks 8th of 50 (3rd of 17 three star hotels.). Our ranking for this hotel based on both its rates and its user rating is 23rd of 45 for pure value for money (Generator Hotel was top).